In 3 Seconds per Test with a Bruker XRF Gun! Handheld XRF technology has firmly established itself as the option of choice in the elemental analysis of all types and grades of steel alloys. It has proven both practical and cost-effective, offering the best value for your steel testing tasks. Contact us via the form on the right to learn about the capabilities and features of Bruker’s XRF steel analyzers – or for a prompt quote! A cool fact to know: ferrous metals are the world’s most reused materials. Steel is straightforward to reprocess because it lends itself to magnetic separation from waste. Scrap steel is re-melted either in an EAF (which relies on scrap 100%) or by way of BOF steel making (using some 25-30% scrap). Regardless of its grade, steel can be recycled to top quality new metal by repetitive iterations. A total of 42% of crude steel production is achieved by recovery from scrap. In PMI (Positive Material Identification) testing, in refineries and in fabrication, Bruker XRF guns have time and again been proven to boost both steel testing productivity and reliability. Uncompromisingly accurate and swift in action, the Bruker handheld XRF steel testing machine analyzes and verifies most steel alloys 3 seconds per test on average. (Low alloy steel takes 5-10 seconds due to the presence of Si.) Steel analysis with latest-generation handheld XRF is generally recognized as efficient and money-saving in a full gamut of industrial applications. Message us now to find out how! 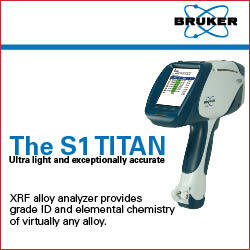 Equipped with a Silicon Drift Detector (SDD), the Bruker S1 TITAN™ boasts superior count rates that perform testing 5 (!) times faster than the previous generation SiPIN XRF guns. 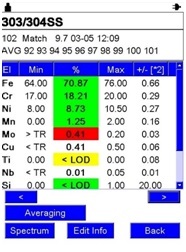 The instrument’s readout gives both the grade and the particular elemental composition of the steel test sample. The Bruker steel tester gun performs its job completely non-destructively, with easy recording and flexible, printable reporting of the data. All data is exportable into Microsoft Excel®. 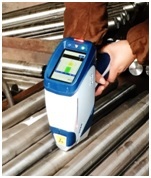 Bruker’s handheld XRF steel analyzers are at the cutting edge of modern steel testing. One major asset of the Bruker S1 TITAN™ is its splendid convenience in use. It will analyze steel objects and components of any shape(e.g. pipes or valves) for a complete PMI scan. And it comes with an extensive library of steel grade definitions, including steel grades commonly found refineries and manufacturing. This library is easily customizable to include steel grade names specific to your industry sector as well as custom grade definitions. Everything here is carefully designed to facilitate your steel testing work. Please contact us now with any questions or to learn more about you it is safe to rely on Bruker’s world leading steel testing equipment. If you don’t see your niche or application on the list, don’t worry, our analyzers will accommodate any flavor of steel, domestic or foreign. Our experts are standing by to address your analytical requirements. Message us now! New to XRF? Briefly, X-Ray Fluorescence analysis is the preferred present-day non-destructive method of scanning the elemental composition of alloys. An XRF device “bombards” the steel alloy with high-energy X-rays against and scans in the secondary (so-called “fluorescent”) X-rays emitted by the alloy in response. Each element in the given steel grade’s composition emits a unique X-ray fluorescent spectrum which serves as that element’s “signature” for accurate identification. The only significant limitation of XRF is it is unable to scan carbon in steel, but it is excellent for all other kinds of steel testing and for identifying the vast majority of present-day and historical steels. Its efficiency and portability compensate for the substantial price of XRF and investing in a Bruker analyzer save you recurring lab analysis fees. Questions? Doubts? Contact us without delay!